Praise God for His goodness. No problem or obstacle is greater than He is! Be blessed as you heal and recover. fasting every January looks like an annual ritual, because we use to experience tragedies during this time as the church, this year Feb, we had a nasty breaking-up in the church. we have decided to stop it and fast sometime during the year. No, because of the chemicals and artificial flavorings and colorings. If you find a gum that is free of sugar and chemicals, please let me know! I’ve searched for a long time as so many people would like to have gum during the fast. Thanks. I am joining in the Daniel fast beginning Wed 18th Feb. I know the Lord will guide me in it. Please add me on your list. God bless you all. Is liquid smoke ok to use? If so, what kind do you recommmend? Thanks! Yes, that is exactly what you should do. As you “examine your heart” you will learn why you chose to break the fast. If it was a mistake, get right back on. But if you intentionally chose to break the fast, then look inside and see what was going on. Then seek the Holy Spirit to teach you how to change the behavior. This can be a powerful experience that mirrors other times in our lives when we miss-step our Christian walk. When you fall off the fast, is it okay to pray and start back up? here is a salad dressing i came up with that is just wonderful! I was shock to find there is SUGAR in the spices, seasonings, salad dressings and canned soup in the stores! (i live on a small island in the Carribean and its hard to get to the city to go shopping) I mixed a little salt w/vinegar (organic apple cider), about 4tbls, add about a cup of extra virgin olive oil, I chopped up (about a handful) of dill and basil leaves from my herb garden and presto, my experiment paid off! (save some dressing for later) I even put a tblspoon or two over my organic brown basmati rice! Hope everyone enjoy this. For tea, squeeze a fresh orange or lime in a cup of hot water and you are good to go! Thanks for the kind words! So many people are getting into prayer and fasting. Let God be glorified as His people come near to Him! Your dinner is right on! It sounds so good, I think I will have it this week, too. We can have nice meals within the Daniel Fast Guidelines. And my hope is that that everyone using this very healthy eating plan as they fast and pray will realize improved health, great clarity in their minds and renewed energy. Thanks so much for sharing your great way to eat a baked potato! Susan – what a great site! I joined Jentezen Franklin’s Daniel fast and have been following the posts at your site and they’ve been really helpful and supportive. My question: I had a baked potato (microwaved) and sauteed in olive oil onion, garlic & mushrooms – no butter!! It was so good I wonder if I didn’t step outside the fast lines?! What do you think? Susan, if you fall off while fasting, what is the best way to regroup and start back up…..does God forgive you for this or is it just a lost cause then? 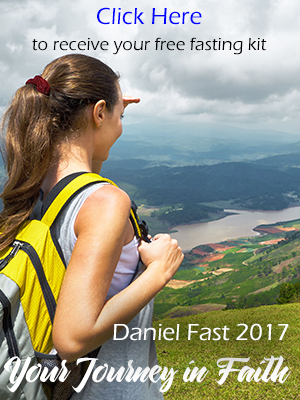 Can you participate in the Daniel’s Fast and do it from 6am – 6pm? Asking this question, because I have had several of my friends ask me and I am unsure as to how to answer them. Thanks for your kind message. I am so glad I have been able to offer some valuable information about the Daniel Fast. Be blessed on your fast! It’s a powerful experience as we focus our attention on the Lord! The only problem with most potato chips is that they have been deep fried, which is not allowed on the Daniel Fast. You might be able to find some organic baked chips that fit the bill . . . or you can make you own! Tomorrow I start my first Daniel Fast with my church, Destiny Christian Center in Chester, VA. Actually, it is my first fast ever. Your website has given me such valuable information! Thank you so much and may God Bless you through out the newyear!! Please keep me in your prayers! My family needs a blessing or two, and I am starving for a closer, personal relationship with our Lord!!! I started the 21 (or 14) day fast on Sunday. I am either eating nothing, having juices only, or having fruit and vegies only, depending on the day. So, it should be ok to have hot potato chips shouldn’t it? This is my 2nd year on Daniel Fast and already start since 3rd of this month. (Last year that start the 1st and was 21 days unitl god add 7 days and last year turn the best). Last year that eat fruits, and vegs indule drink water only. This year that same like last year expemt drink 100% juice and brown rice. Honesty…I still learning about Daniel Fast so keep me up in prayer. Please add me on the list and what god have store for me in ’09. I have fasted before but I have never done the Daniel Fast. I really need a miracle from God for my household and I believe that fasting and praying is a key component in the life of a believer. I am started out with a three day fast to destroy the bands of wickedness and ask God for divine insight and wisdom. I will start the Daniel Fast after I complete the three day fast. I am “believing God” for a miracle for me and my family, I am also praying for divine guidance and understanding. I want a closer walk with God and I know he will make it happen. All things are possible to them that believe. Yes, salt and pepper along with all other pure herbs and spices are acceptable on the Daniel Fast. can you use sea salt and black pepper? My church started a 21 day fast January 1st, 2009. We are praying for a great revival and also a new addition being added on to our church. I did okay the first couple of days. But this evening I started feeling so cold that I thought, “just this one time I will have a hot cup of coffee.” Well, I had about 2 cups and after that I couldn’t quit eating potato chips and I even drank a soda! Now I feel so ashamed and that I let my church down. If I start fresh tomorrow will the Lord honor this. I should’ve knelt on my knees in prayer and asked for strength instead of giving in to temptation. I have always had problems with cold hands and feet though and it got worse after I started the fast. Yesterday my hands even looked purple! Any advice for replacing that hot cup of coffee with something else? I didn’t know I would feel so cold and also so irritable! I love the Lord and want so much to do this for Him. I just want to be in His will. I worry though that I let everyone down and that we won’t see as much a result because of me. Thank you for such a good website. I am new to fasting so this is a great help. May God bless you and I will be praying for you. is soymilk ok to drink as part of the Daniels fast? plz let me know.Thanks. The Lord wants you well! So this would be a great opportunity for you to enter the New Year Fast using the Daniel Fast method . . . and realize powerful benefits. You might want to consider using this fast to learn more about Jesus as the Healer. There are several really good books that you can read and study about this amazing gift that we have available to us through Jesus. I was miraculously healed two years ago . . . all through prayer and renewing my mind to the ways of Christ. I hope this helps your decision about starting the New Year fast. I think the Lord is calling you to experience Him in deeper ways. He loves you so much and wants you to realize all that He has for you!